We're keeping it short and simple this Monday morning with a look at some digital wedding invitations that we did for super couple, Kate and Warren. The wanted something simple, modern and contemporary, which was right up our alley and an invite we really enjoyed doing. We created a fun "&" motif using lines and kept the text modern and clean. 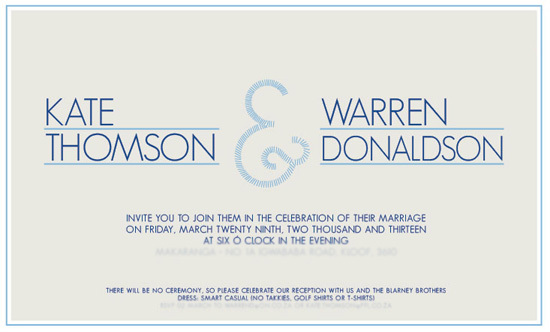 Light blue, navy and cream was the palette used to enhance the modern feeling of these invites. What do you guys think? Copyright to Ruby and the Swallow 2013. No replication for private or public use.